Clarified butter is unsalted butter that has been cooked down so that the water and milk solids separate from the butterfat. The butter is strained, and the golden liquid that is left behind can be used for everything from frying to baking. Ghee is a little bit different, instead of straining it after the water and milk solids become separated from the butterfat, you continue to cook the butter. This causes the milk solids to caramelize and give the ghee a slightly nutty flavor and a deep golden color. You then strain the ghee, just as you would clarified butter, to remove those caramelized bits. Ghee has a more fragrant and prominent flavor than clarified butter because of the caramelization that happens but it is not as flavorful as brown butter. Ghee (and clarified butter) can be used for high-temperature cooking, as it has an extremely high smoke point, which is the temperature where a cooking oil or fat begins to smoke. This higher smoke point makes ghee a healthier choice than other oils and fats when cooking over high heat. 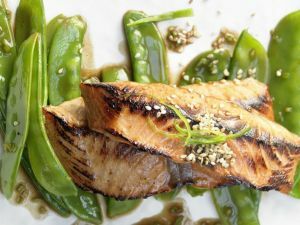 When oils and fats reach their smoke point, they produce dangerous free radicals. Free radicals can be harmful to our health and may even induce early aging. 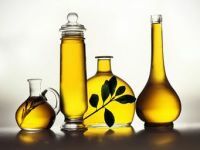 This is why it is recommended not to cook with oils such as olive oil since it has a low smoke point, it is best reserved for things like salad dressings or drizzling as a finishing touch. Ghee can be used in almost any application that butter is used, such as sauteing, roasting, or even spreading on a fresh piece of sourdough bread. Because the milk solids and water have been removed, ghee is very stable and can be left at room temperature in a well-sealed container. Though if you make a big batch, it will last longer stored in the fridge. Ghee is not just great for flavor enhancement, it is also good for your health. 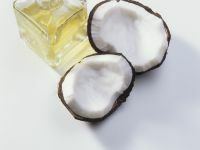 It is touted in health communities such as Ayurveda and paleo. Some people have even begun to put ghee in their coffee. Since the milk solids are removed from ghee during the cooking and straining process, it is even a suitable option for people who are lactose intolerant or those that follow a dairy-free diet. Ghee is also a good source of vitamins and substances with antioxidant properties. Vitamins A and E are both found in significant quantities in ghee, vitamins A and E are essential for the development and proper functioning of many systems in the body. One of the main antioxidants found in ghee is called CLA, or conjugated linoleic acid. CLA is typically found in meat products and is most prevalent in grass-fed meat and dairy. CLA is still being researched but it may help prevent cancer and viruses. Just like coconut oil, ghee is a source of medium-chain triglycerides, which are more quickly and easily absorbed by the body. 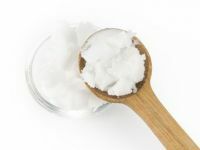 These MTCs provide quick, long lasting energy for our bodies because of the way they are broken down. 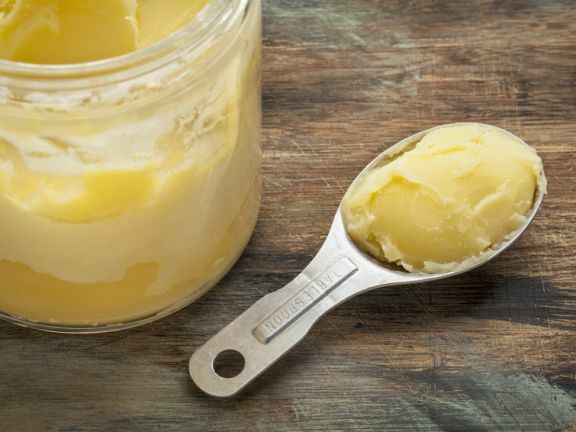 Ghee also contains a short chain fatty acid, called butyrate. Butyrate may help to prevent certain cancers and digestive issues. Ghee is a healthy fat that adds more than just flavor to your diet, it also provides you with vitamins and nutrients that are needed for a healthy, well-functioning body. If you have not tried ghee yet, follow the recipe below to make your own then add it to some of your favorite dishes in place of the butter or oil. Add the butter to a medium, light colored pan. Melt the butter over medium-low heat, stirring occasionally. Cook the butter for 20-30 minutes. The butter should stop sputtering (meaning the water has evaporated out of it) and you should notice some solids on the bottom of the pan (these are the milk solids). Continue to simmer the butter until the milk solids turn a golden color, then pour butter through a cheesecloth-lined sieve and into a well-sealing jar. Allow to cool to room temperature. The ghee can either be stored in a dark place at the room temperature (it will last 2-3 months this way) or stored in the refrigerator for prolonged use. 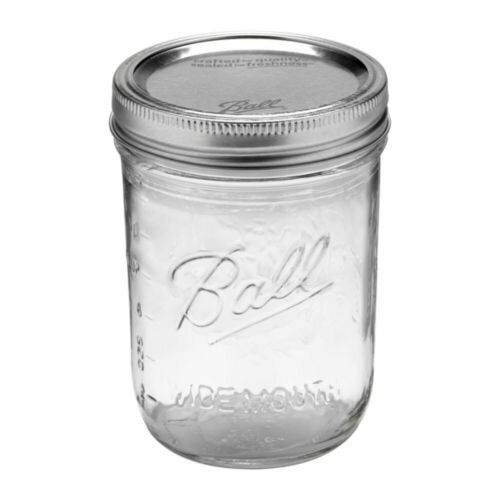 Ball Mason Jars have an airtight seal, perfect for storing your ghee!